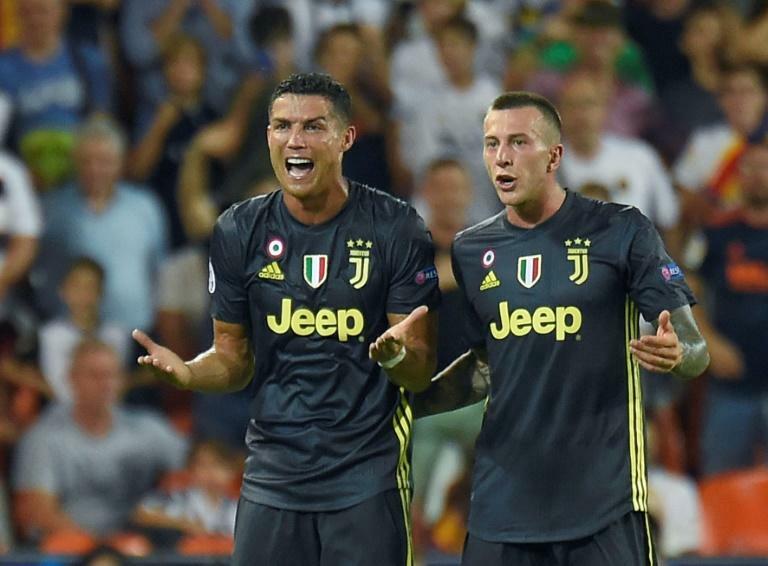 Juventus believe they can win the Champions League with Cristiano Ronaldo, but they had to start by beating Valencia without him after he was controversially sent off on his debut in the competition for the Italian champions on Wednesday. A tearful Ronaldo left the pitch in disbelief in the 29th minute, having aimed a petulant, but seemingly harmless, kick at Valencia defender Jeison Murillo. The Portuguese player then made contact with Murillo's head while urging him to get up. Ronaldo dropped to the floor like the tournament was lost after German official Felix Brych brandished the red card but Juve showed more composure, Miralem Pjanic scoring twice from the penalty spot to clinch a comfortable 2-0 win. It remains to be seen how UEFA judge Ronaldo's offence, and dissent, but he is set to miss the next European game at home to Young Boys on October 2. After that comes the more threatening double-header against Manchester United. "I can only say that VAR would have helped the referee make the right decision," Juventus coach Massimiliano Allegri said afterwards. UEFA are yet to approve the technology in Europe's premier club tournament. Valencia fans celebrated Ronaldo's dismissal at the Estadio Mestalla like a goal had been scored but, in truth, their team missed a golden chance to gain a foothold in Group H.
Instead, Ronaldo's absence had little effect. The Italians won -- with ease. "Come on Cristiano, give us Europe," read the headline in Italian daily Gazzetta dello Sport. "You could say he's increased the players' desire to prove themselves," Allegri said. "He's raised the bar for everybody." Juventus have claimed seven Serie A titles in a row but the Champions League is the one they want. They last won that in 1996 when Ronaldo was 11 and still playing youth football for Nacional. Valencia fans lined the streets outside just to witness the buses pull in, booing the visitors and Ronaldo, in particular. They also jeered him during the warm-up, during which Ronaldo replied by banging a ball into the open net from two yards. Valencia's last game in the Champions League was Gary Neville's first as manager and there have been four more in charge since. Jose Gaya and Parejo were the only players left on Wednesday from that night but change has not yet bridged the gap with Europe's elite. "We are not prepared to compete consistently with teams at this level," Valencia head coach Marcelino said. Ronaldo started brightly, with an ambitious shot from distance, and then had a hand in teeing up two glorious chances. He first crossed for Federico Bernardeschi to set up Sami Khedira, before misfiring into the path of Mario Mandzukic six yards out. Each fluffed their lines. Then, the moment the match will be remembered for -- Ronaldo let frustration get the better of him and Murillo made the most of it, falling instantly. Brych was convinced. Valencia probed but even when Daniele Rugani collided with Gabriel for a third penalty, Parejo's shot was saved by Wojciech Szczesny. There was never any hint of a comeback.